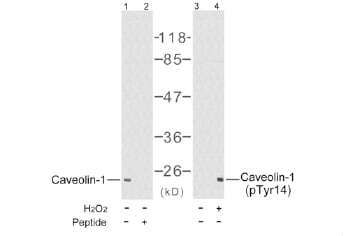 This antibody is specific for Caveolin-1 only when phosphorylated at tyrosine 14. Synthetic peptide corresponding to Human Caveolin-1. The antibody against non-phosphopeptide was removed by chromatography using non-phosphopeptide corresponding to the phosphorylation site. Our Abpromise guarantee covers the use of ab38468 in the following tested applications. WB 1/500 - 1/1000. Detects a band of approximately 20 kDa (predicted molecular weight: 20 kDa). May act as a scaffolding protein within caveolar membranes. Interacts directly with G-protein alpha subunits and can functionally regulate their activity (By similarity). Involved in the costimulatory signal essential for T-cell receptor (TCR)-mediated T-cell activation. Its binding to DPP4 induces T-cell proliferation and NF-kappa-B activation in a T-cell receptor/CD3-dependent manner. Recruits CTNNB1 to caveolar membranes and may regulate CTNNB1-mediated signaling through the Wnt pathway. Expressed in muscle and lung, less so in liver, brain and kidney. Defects in CAV1 are the cause of congenital generalized lipodystrophy type 3 (CGL3) [MIM:612526]; also called Berardinelli-Seip congenital lipodystrophy type 3 (BSCL3). Congenital generalized lipodystrophies are autosomal recessive disorders characterized by a near absence of adipose tissue, extreme insulin resistance, hypertriglyceridemia, hepatic steatosis and early onset of diabetes. Belongs to the caveolin family. The initiator methionine for isoform Beta is removed during or just after translation. The new N-terminal amino acid is then N-acetylated. Golgi apparatus membrane. Cell membrane. Membrane > caveola. Membrane raft. Colocalized with DPP4 in membrane rafts. Potential hairpin-like structure in the membrane. Membrane protein of caveolae. Lane 3 : NIH 3T3 cell extract. Lane 4 : NIH 3T3 cell extract. Treated with H2O2. Publishing research using ab38468? Please let us know so that we can cite the reference in this datasheet. Yes that is correct 2uL aliquots were used so as to avoid repeat freeze thaw cycles. This however still does not help to explain why these aliquots would work beautifully for immunofluorescence and fail to do so for western blotting which is a more sensitive technique. At this stage it is difficult to identify the source of the problem and to be sure why this antibody failed to work in Western blot application. It would be interesting to know 1) how well the vial was centrifuged before preparing the aliquots 2) whether the customer has used exactly the same aliquot for IHC and WB (head-to-head) or 3) separate vials for these two applications. In future, I would like to advice and encourage the customer to aliquot the product in no smaller than 10 µl; the smaller the aliquot, the more the stock concentration is affected by evaporation and adsorption of the antibody onto the surface of the storage vial. The other thing which may be important to consider is the blocking agent. As I understand from the previous e-mail, the blots were blocked for 1h with 5% skim milk and then incubated with the primary antibody (1:1000 – as from the tested conditions) overnight at 4 degrees. Is that correct? How were the slides blocked for IHC/ICC? Was milk applied as blocking agent for IHC/ICC as well or BSA or different solution? Normally, for detection of phospho protein we would suggest using 5% BSA solution - as blocking - rather than milk. Milk may lead to significant decrease or loss of signal intensity due to reaction of primary antibody with blocking/diluting agent. I hope this will be useful for you. Should you still have any problem with this antibody after following these suggestions, then please do not hesitate to contact our Technical Department again. I have tried doing an Immunoprecipitation of the protein from my sample in the hope of concentrating it in order to detect it but that has not worked. I was wondering if it would be the lot# that I had got from abcam. a) Know whether the lot number that abcam tested was the same as the one that I had got. b) Also if it would be possible for a small amount of another batch number to be sent out to me for me to try out for western. - not a whole sample even just a little. - and if it is the batch that I recieved I will be more than happy to purchase a full antibody for me to do the plethora of experiments that require it. I really want this antibody to work and as it does work beautifully for immunofluorescence, and in conjunction with potential interactions that this protein has, I require it to work for western blotting. Any help in this regard would be fantastic! Hope we can help, hope to hear from you soon! My colleague is out of office for the rest of the week. I have tried to review this case and noticed that 2 ul aliquots were prepared. This may contribute to the problem your customer is facing with. The size of the aliquots will depend on how much one typically uses in an experiment. Aliquots should be no smaller than 10 µl; the smaller the aliquot, the more the stock concentration is affected by evaporation and adsorption of the antibody onto the surface of the storage vial. I would advise to read this guide carefully, it has useful information storage. If you need anything further or any help then please let me know. Q. Did you contact Abcam's Scientific Support by telephone in reference to this complaint? Q. Was it clear from the phone options which number you needed to press to get your issue resolved? Q. Did Abcam's Scientific Support give you protocol advice? Q. How did you feel about being given protocol advice? Q. Did the product work successfully after following the advice? Q. Did Abcam's Scientific Support give you a free of charge replacement? Q. Did the replacement product work successfully? Q. Did Abcam's Scientific Support give you a credit note or a refund? Q. Would you have preferred a different outcome from receiving a credit note or refund? Q. How satisfied are you with how the complaint was handled? Q. Could we have done anything to better resolve the problem? Q. Would you mind if our scientific support team contacted you to better understand what happened and reach an agreeable solution? Q. Please provide a phone number or email address where we can reach you. Q. Please share with us any final thoughts you may have about Abcam, the complaints process, or our products. Thank you very for participating in Abcam complaint survey. We have provided the credit noteof full price; you can buy another antibody with that credit note without paying anything. I hope you have done that. We had alsotried to solve the case however we were not able to determine the reason, why this antibody was not detecting band in WB as it should though it was OK in ICC/IF. So do you need any further assistance? If yes, please let us know, we will be happyto help. Your credit note ID is XXXXXX. (1) Redeemed against the original invoice if this hasn't already been paid. (2) Held on the account for use against a future order. (3) A full refund can be offered where no other invoices are outstanding. Please contact your Finance department to confirm how you would like the credit note to be used and ensure it is not redeemed without your knowledge. To specifically receive a refund please ask your Finance department to contact our Finance department at creditcontrol@abcam.com or by telephone using the information at the “Contact Us” link in the top right corner of our website. The credit note ID is for your reference only, please refer to the credit note ID in any correspondence with our accounting department. We will send you the completed credit note by email or postal mail with the actual credit note number which will start with the letters CGB. regarding the issues with the antibody - I am unable to obtain huvec cells - I have tried lysates of liver, and kidney and they are positive contols for this protein - I still cannot get it to work. Thank you very much for your cooperation. I am sorry to hear this antibody is not providing satisfactory results. Having reviewed the protocol details again, I believe this product should have given satisfactory results. It is regrettable the results have not been successful. I apologize for the inconvenience and am pleased to offer you a credit note, or refund in compensation. Thank you for your cooperation. I look forward to hearing from you with details of how you would like to proceed. thanks for forwarding abcam's reply. I tried using a liver and an ovary lysate (loaded 50ug of protein) as a positive control and at a dilution range of 1:500 - 1:1000 there are still no bands. This antibody works perfectly fine for immunofluorescence as I can see specific staining for the phospho-cav 1 protein in the uterus but I still cannot get it to work for western blotting. Thanks you for your email. This antibody should bind to reduced or denatured form, because we got positive binding for Western blots with the lysates of HuvEc and Hela cells. We haven’t received complains about this antibody. We didn’t use the antibody for tissue lysates. The phosphorylation on this site may be low in liver and ovary. So we recomend trying HuvEc lysates as positive control. I hope this information will be helpful. HSould you have any other question please do not hesitate to contact us. It works fine for immunofluorescence on cryosections – a technique that had not been tested. The antibody from the spec details had been tested for western blotting. It however does not work at all for this technique. There are no bands present at all. Tissue is collected and immediately homogenized with lysis buffer (SDS, DOC, Igepal, NaCl, EDTA), aliquoted and protein estimated and stored at -80degrees until used for western blotting. Samples are prepared with a loading buffer containing b-mercapto ethanol and boiled for 5minutes prior to loading on a gel. Samples are then run at 200 V for 45 min; and transferred to PVDF membrane for 1h at 100V. Tried using a different blocking percentage of milk 0.5% - 2 % and even not blocking at all. Positive controls have been kidney. – antibody works perfectly fine in immunofluorescence for the tissue being studied. How many times have you tried the Western Blot? What steps have you altered? I have as outlined above – altered the dilution range drastically to a 1:250 dilution. I have tried lysing my tissue with a lysis buffer with no SDS or DOC with the same conditions as has been outlined. Thank you for your email. I am sorry to hear that you are experiencing problems with this antibody. This antibody has not been tested with rat lysates so we currently do not hold any rat and human comparison data. Although rat species is a predicted species however this is totally based on assumption of sequence homology only. Our recommendations is to try a human (HUVEC cells) or mouse kidney cell lysates treated with PMA 125ng/ml for 30 minutes as positive control. The ab38468 antibody is a phospho specific antibody you may need to induce the phosphorylation of the Caveolin protein. In uterus this protein is expressed at low level so we recommend using lysates of liver, ovary (stroma cells), HUVEC cells, Hela cells (PMA treated) as positive control. I hope these suggestion will help to improve results. Should you have any other question please do not hesitate to contact us.